St. Louis, Mo., Feb. 16, 2016—Western Specialty Contractors, Des Moines, Iowa Branch (formerly named Western Waterproofing Company), played an instrumental role in preserving a 136-year-old row house in Des Moines, Iowa originally destined for demolition to make way for expansion of the Iowa State Capitol grounds. Instead, the historic building was moved to a new location in the city’s popular East Village neighborhood and repurposed as a restaurant. Originally designed and built in 1880 by prominent business leader Samuel Green for his family, the building, formerly named Norden Hall, has served as a private residence and home to three Scandinavian community groups. Built on the western edge of the Iowa State Capitol grounds, private developer Jake Christensen was determined to save one of the city’s oldest historic landmarks. He accomplished this by moving the 440,000-pound building four blocks from 707 E. Locust to a new foundation at 435 E. Grand. The building was in need of miscellaneous masonry repairs and was not watertight. Western crews started the project by waterproofing the foundation and replacing all of the building’s joint sealants. Western then began the process of resealing the structure by cleaning its entire surface to remove any residue that had accumulated over time. Miscellaneous tuckpointing was performed throughout. Spray-applied concrete, or shotcrete, was then sprayed on the building’s entire west elevation to add structural integrity to the deteriorated masonry wall. Once the new concrete had cured, a textured acrylic coating was applied to the west elevation to waterproof the wall and maintain its historic appearance. The building now houses a wine bar and has been registered as a historic landmark. “Historians from Des Moines are proud of the work that was done to preserve this important part of the city’s history. 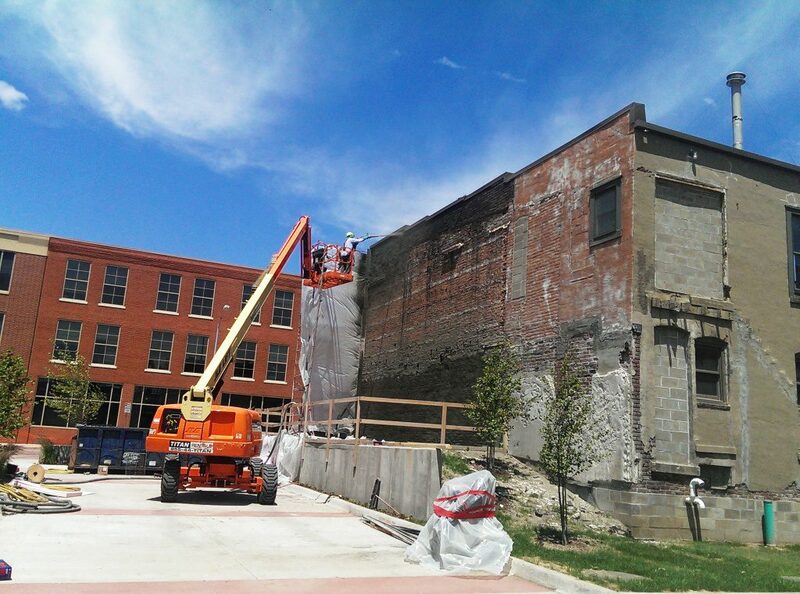 This piece of history could have been lost forever, but through the efforts of Western Specialty Contractors, general contractor Beal Derkenne Construction and Slingshot Architecture, this building will stand for many more years to come and continue to be enjoyed by the city’s residents,” said Western Des Moines Branch Manager Tom Longer. Family-owned and operated for 100 years, Western Specialty Contractors is the nation’s largest specialty contractor in masonry and concrete restoration, waterproofing and specialty roofing. Western offers a nationwide network of expertise that building owners, engineers, architects and property managers can count on to develop cost-effective, corrective measures that can add years of useful life to a variety of structures including: industrial, commercial, healthcare, historic, educational and government buildings, parking structures and sports stadiums. Western is headquartered in St. Louis, MO with over 30 branch offices nationwide and employs more than 1,200 salaried and hourly professionals who offer the best, time-tested techniques and innovative technology. For more information about Western Specialty Contractors, visit www.westernspecialtycontractors.com.